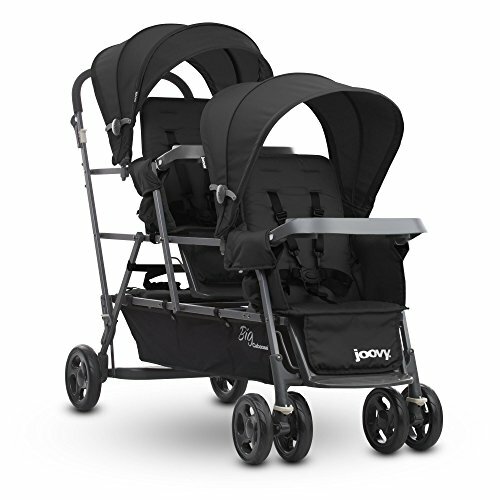 The Joovy Big Caboose Graphite Stand-On Triple Stroller makes it possible to stroll with three young children. The Big Caboose Graphite includes two full-size seats with ample legroom, removable canopies, two child trays and two universal car seat adapters. Both front seats have a 2-position recline and an adjustable footrest. The rear bench seat and standing platform empowers the older child to sit, stand or walk alongside the stroller. A new larger rear canopy provides coverage for the older child when sitting on the rear bench seat. If all three children are close in age or you have triplets, the optional Joovy Caboose Rear Seat accessory can be purchased to convert the stroller's rear bench seat into a full-size reclining seat. It installs easily over the existing rear bench seat to give you three full-size reclining seats with 5-point harnesses. The Big Caboose Graphite can carry up to 125 lbs. so it takes a bit of strength to push and maneuver the stroller when fully loaded. It features sealed-bearings in all the wheels to make pushing and steering the easiest it can be and a linked parking break. All-wheel suspension provides a smooth ride for passengers and the stroller's narrow width makes it easy to go through doorways, hallways and store aisles. When folded, the Big Caboose Graphite measures 14H x 21.5W x 63L inches long (or 54 inches long without the front canopy and tray) so you need a large vehicle to transport this stroller. However, it is remarkably lightweight at only 32.3 lbs.